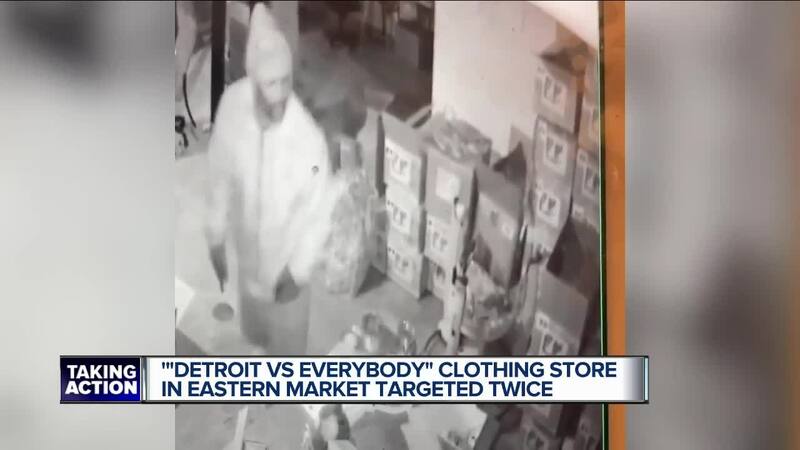 The Detroit Vs. Everybody store in Eastern Market has been targeted by thieves twice in the last dew says. DETROIT (WXYZ) — For Tommey Walker, owner of the Detroit vs Everybody clothing store, this is personal and painful. He’s had two burglaries and thefts in two weeks. He wants you to look at his surveillance video and if you know who these guys are, call Detroit Police. At 10:30 Sunday night, you can see a guy tearing into boxes of clothing and taking an estimated $30,000 worth of goods. As one guy walks out, he covers up a camera with a box. In another video you can see a young guy put some shirts inside his coat while the store is open. “We’ve had teenagers - maybe from the ages of 16, 19, 21 - coming in while we’ve been open and taking a shirt," Walker said. "It’s been very stressful on our sales associates." Walker also believes all of the people targeting him and his store may be the same guys. This is personal and painful for him.